Here I come with the next and last part about basic baking ingredients. The ingredients here are listed in alphabetical order as in my previous post. This post doesn't include baking paraphernalia or cake decorating ingredients in much detail. Again this is just a brief introduction to the ingredients, keeping the beginner baker in view. I have provided links to previously written posts to avoid unnecessary repetition and cut down the length of the post. So, without much ado, her goes.. Images are mostly from the world wide web. Fondant - The sweet soft play-dough kind of thing used for topping cakes, lettering and making little figures for decorating cakes, perfect for a kiddie birthday cake. Am not into decorating with fondant and you will never catch me eating it, but have used Wilton fondant and found it really nice to work with. Unless you need large quantities of colored fondant for frequent use, a small pack of white fondant can be tinted with gel color and used. Rolled fondant works as a nice canvas to paint piping gel on. 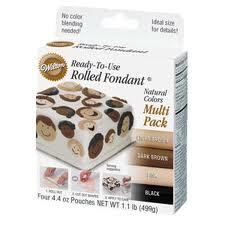 Fondant is now available here at General Food Additives (GFA), no haven't used it yet! 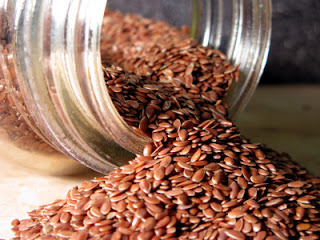 Gluten - As an ingredient used in baking breads, this refers to vital wheat gluten (picture below). 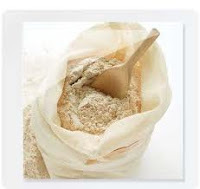 Used to make bread flour ( 1 cup / 130 grams APF mixed with 1 table spoon gluten is 1 cup bread flour) and also used for baking breads with whole wheat flour in the same proportion.When added to the bread dough, it provides extra gluten to the flour, specially whole grains. It helps bread rise to the maximum height, retain the height, thereby making your bread softer and better in texture. Available at GFA in one kg packs, sold loose at IBCA . Check this online resource Bakersmart . I buy mine from GFA. If you do not bake breads very often, its a good idea to buy a kilo of packed gluten (more hygienic anytime) and share it with a friend. Golden Syrup - Another by-product of sugar manufacturing, this looks similar to honey. Check at Godrej Natures basket, Spar, Namdharis and Supermarket. 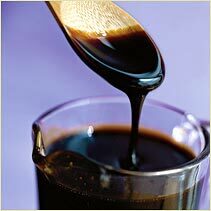 Corn syrup, light molasses are things you could use as substitutes depending on the recipe. Honey - A very commonly stocked ingredient in most kitchens, honey comes in handy for baking breads, granola etc. I normally buy Dabur honey which comes with a convenient, less messy, squeeze-pour err..technology. So far, I have not tried baking with home-made honey. Liquid Glucose - This ingredient is mostly used in making jams, ice creams, marshmallow, fondant, candies etc. It is supposed to help prevent formation of sugar crystals. It can be used as an alternative to corn syrup. Try at your pharmacy, GFA and other baking stores. Maple syrup - A sweet, aromatic syrup made from the sap of maple trees, this is often used as a sweetener in baked goods. Also used as to serve with pancakes, waffles etc, its supposed to lend a very nice distinct smoked aroma and flavor. Honey is the more economical locally available substitute. Pancake syrup contains only a small percentage of maple syrup, so not really a substitute. This is another ingredient which comes highly priced. Check for availability at Supermarket or Nilgiris, Brigade Road, Namdharis and GNB and Zansaar. Marzipan - This is a sort of paste made basically of almond paste / ground almonds, sugar and almond flavoring, Think almond katli (in taste), with uses similar to fondant. Can be tinted with food color, its used to cover cakes, traditional breads like stollen, fruitcakes, wedding cakes and in making small decorative figures. This is seen here more during Christmas time, Nilgiris has this mostly. You could also make your own. Check Deeba's recipes here and here. Milk - When recipes call for whole milk, specially for baked custards and other custard based dishes, be sure to use whole milk. It does make a lot of difference to the taste and texture of the end product. I use Nandini milk with 4% fat (the one which comes in an orange pack). Otherwise when you need to use milk in other recipes as part of the liquid, you could use low fat milk (2%) or even the almost fat free milk without much of change in the baked goods. Evaporated milk : Not to be confused with condensed milk, this is milk processed to remove 60% liquid, mostly unsweetened. Supposedly, this can be reconstituted with water to make milk. I am not aware of any local sources for this. Condensed milk : The ever popular ingredient used for making desserts mostly, Milkmaid the most popular brand here. This one is also milk processed in order to remove the liquid. What we get here is mostly (over)sweetened. 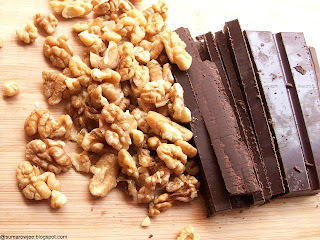 Unless the recipe has something to really balance it out, you can expect the baked product to be on the sweeter side, cloyingly sweet if the cake/dessert also has sweetened chocolate / sugar in it. Milk powder: A great thing to have in your pantry, this is very good in yeast breads. Since its not perishable like milk, you will find it specially useful when you use the delay start feature in your bread machine. You could weigh out the dry ingredients of the bread recipe like flour, salt, spices, sugar and milk powder and store it in zip-lock bags to make that bread needed in a hurry. It adds color to the bread, even if there isn't more sugar or eggs (both of which help give color) in the recipe. Nandini skimmed milk again, available at super-markets and of course at your nearby milk booth. You could also make low fat khoya for your desserts. Nuts - Nothing like rancid nuts to ruin that otherwise perfect cake or dessert! Be sure you buy these from a good whole sale shop or super market. If you buy in large quantities, store them in the freezer to prevent them from turning rancid. Paranoid about smelly walnuts, I check with the store if I can get a refund/exchange in case the nuts are have already gone rancid. Hazelnuts are even more expensive, pecans not commonly available. GFA now stocks hazelnuts too. You could easily use ground walnuts in the place of hazelnuts in cookies and cakes. Get your nuts to room temperature, chop /bash them before you grind them. Oil - Extra virgin olive oil (EVOO) is best for pizza sauce, dips and the kinds as it gives a very nice aroma and flavor. Otherwise when recipes call for oil such as canola or safflower, you could use sunflower or rice bran oil, or pure olive oil. Any oil as long as it is neutral in taste and flavor. Avoid peanut oil as it has a distinctive smell. Coconut oil (Parachute, not advanced!) is great in your coconutty bakes such as coconut bars or coconut bread. Oats - These whole grains are rolled and flattened into flakes under weight, steamed and lightly toasted to give you rolled oats. These could be old fashioned rolled oats (the thicker, chewier variety) or quick cooking oats like Quaker. For my granola bars, and granola, I like to use Quaker quick cooking oats. I avoid jumbo oats as they are really thick and very chewy. 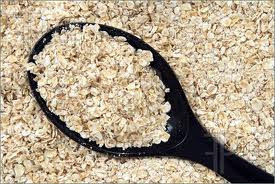 Make your oatmeal by simply grinding quick cooking oats in your mixer. Again oat bran is a different thing, used to add fiber and texture to baked goods. Potato flour & flakes : Though am not much of a fan of this product in my cooking, I love using this in my potato rolls! Makes your bread really soft, without the hassle of having to weigh (or guess the approximate size of potatoes) boil and mash potatoes. More standardized too definitely as you can easily weigh them. I don't love it when a bread recipe says 2 medium sized potatoes. 50 grams of potato flakes is so simple and easy! I use Vegit Aloo Mash for this. You could also use cornstarch in the same quantity to substitute potato flakes says Champa. 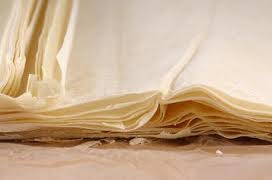 Phyllo / Filo pastry (above) : Admit it! You are now thinking of Baklava! Crispy, flaky pastry which can be put to really versatile use. Bake with sweet/ savory fillings or as a base for tarts, strudels and other desserts and appetizers. Unlike puff pastry, this one thankfully isn't loaded with butter, in fact, made without butter in the pastry per se. This is available here at Godrej Natures Basket, check at Supermarket, Brigade Road, Food World Gourmet store, MG Road and Sorbet. Expensive again, but hopefully good to use when you are pressed for time. Make your own, for the fun of it and yes, its so so very inexpensive! Check this post of the Daring Bakers. Puff pastry : Buttery, flaky pastry, super versatile as a base, can be filled with sweet or savory. Commercially sold puff pastry sheets here are mostly made with margarine and are also sold in bulk, so not highly recommended. 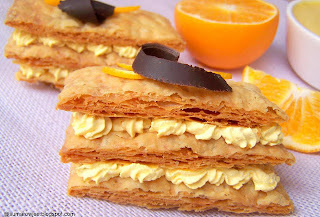 Loved making mock puff pastry (above) works great for me, yet to try the real puff pastry! Make your own with good quality butter at home, have a party with all the uses you can put it to! Saffron , saffron extract - This aromatic spice of good quality is not very easy to find here. My saffron strands sourced by my sis-in-law in the US. You could also try saffron extract, quite good, I have used it here. Am not very sure about the economics part, but the extract would be very convenient to use in recipes which can do without the addition of liquid (the milk you would need to soak the saffron strands in) - cookies, saffron flavored whipped cream? More details on the extract here. Sugar : Info on this in my previous post. Vanilla : The baker's indispensable companion, the aroma which makes your home smell so good when you bake! I used to use vanilla essence earlier, but have now started to use pure vanilla extract. Its really easy to make at home - just dunking a couple of good quality beans in vodka and letting it infuse the flavor for at least 6 weeks, the longer the better! Vanilla bean sugar can be made by grinding used, dried beans with sugar. Great used in bakes as well as a topping for your cookies, cakes. 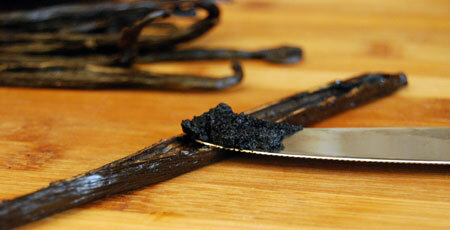 Buy good quality vanilla beans, i.e, beans which are shiny, moist, plump and can be bent around your finger easily. Beware of the inferior quality ones which look like dried twigs. I get my beans from Ecospice, Thankamany Post, Idukki District, Kerala. Ph: 919447330803. email : ecospice@gmail.com. Information courtesy, Deeba Rajpal. I find the beans of good quality, reasonably priced. Using the bean and extract together gives a very nice vanilla flavor and aroma without being overpowering. Now please don't blame me if you start disliking synthetic essence! Vinegar : A commonly used ingredient in both cooking and baking, you have white vinegar, apple cider vinegar, balsamic vinegar, rice wine vinegar to name a few. Plain synthetic distilled vinegar is very commonly available in most departmental stores. Can be used to make buttermilk etc. 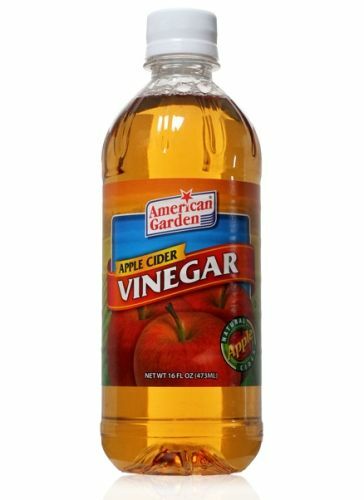 Apple cider vinegar has a more fruity flavor and more suitable for using in cake / cookie batters. American Garden's apple cider vinegar is good and reasonably priced. 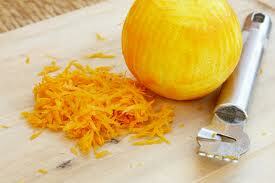 Zest : Nothing can bring the intense zesty flavor of oranges / lemon like zest can! The outer part of the skin of the fruit called zest is your best bet for your orange cakes, cookies and lemon curd. Use a citrus zester ( I use a Microplane zester) to grate the zest, scarping only the orange/green part. The white part of the skin called the pith is bitter, so do not scrape it. If you do not have a zester (get one! ), peel the skin of the orange (without the pith) with a sharp knife , grind it with some of the sugar in the recipe. Yogurt : Plain unflavored curd, home-made or packaged. Use whole or fat free as recommended in the recipe. 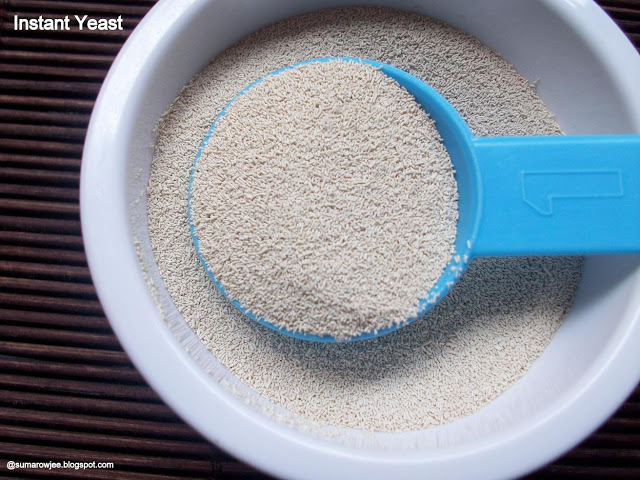 Yeast: Your leavener in yeast breads, commonly available in the form of active dried yeast and instant yeast. Be sure your yeast is good and you store it properly. Your yeast is good enough or not? Check this post here. I like, no, love using instant yeast! Its your safest bet, beginner friendly. Gloripan, Angel, Eagle are some brands of instant yeast you can find at GA, IBCA, Natures Basket and Brown Tree. I buy a 500 gram pack (great value for money at Rs.125 or so when I got last), store in 2-3 tight lidded boxes in the chill tray of my fridge. Try your luck at these online stores too - Zansaar, Bakersmart and Foodforethought. I am yet to shop from these sources, so please don't hold me on this :) Do you have any more ingredients to add to this? Or share information on good online sources for baking ingredients in India? Thanks for this lovely post. Very very informative. GFA is like a little treasure house ! Thank you so much Suma....The article on baking ingredients is fantastic...It will help many bakers who have the recipies, but now they will know the sources as well...!! Wat a wonderful post again, fabulous and definitely a useful post to each and every bakers. Your series is most informative. thanks.